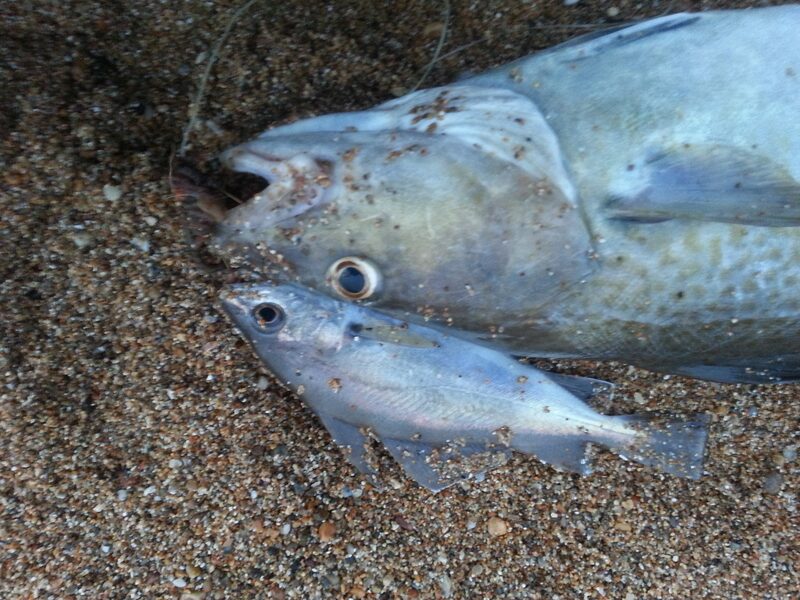 The past few days have seen a lot of fish coming from all along the beach. Most notable were the number of Codling that have been caught at the Western end of Chesil, especially around Cogden and West Bexington. 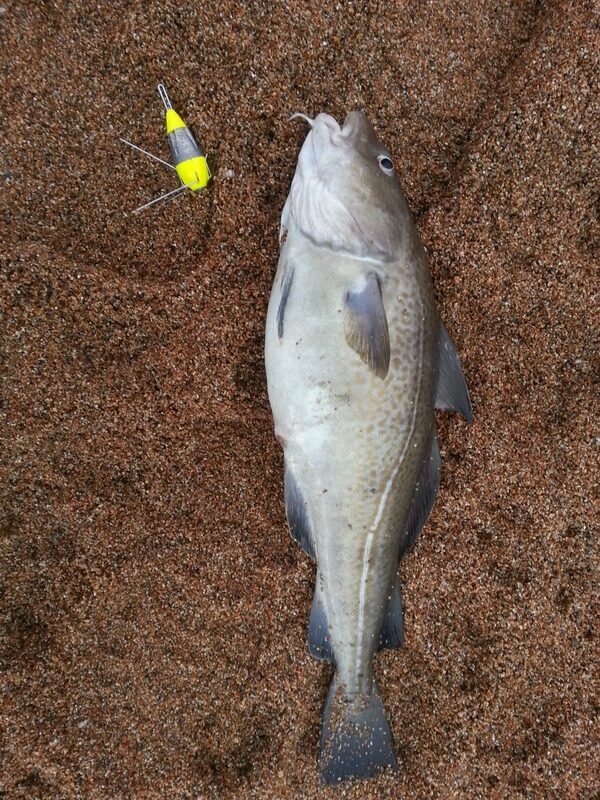 I was lucky enough to get in on the action with 3 almost identical in size Codling. All 3 of them weighed 3lb 9oz and were caught on Lugworm. I did have one of them on a Pennel that had a Pout attached to the top hook, so it may have been after the Pout. Plenty of Whiting and Pout for me as well. Unfortunately the way that the colour has dropped out of the water and the sea has calmed down, I think today could be a case of “you should have been here yesterday”. The one species that does like these conditions are Dabs. Small hooks baited with small pieces of frozen black Lugworm are the best bait for the delicious little flatties. Portland: The water is only slightly coloured on most of the Portland marks, with only a small swell to contend with. Chesil Beach forecast: I have seen it so often after a big blow, that once the water clears down to a slightly coloured twinge nothing gets caught during the day for a few days. I fear today is going to be one of those days and tomorrow is most likely going to be the same. Night sessions will see plenty of Whiting, Pout and Dogfish, but very few if any Cod. Portland: The Wrasse will be hungry after the battering they have had recently, so they should happily take any Ragworm or crab bait that is presented to them. 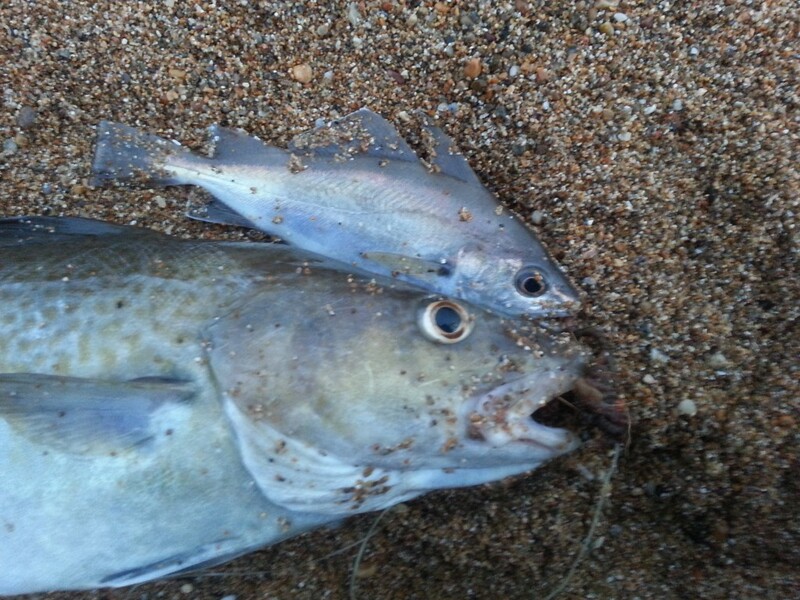 A good chance of catching a Pollock or a Bull Huss on a large Mackerel bait. Church Ope Cove would be a good spot to try today. Portland Harbour: A few Flounder are all that I have heard about coming out of the harbour. Having said that there are not many people fishing it at the moment. Weymouth Bay: There is still a lot of water coming down from the harbour, but it is worth giving the Stone Pier a go for Pollock, Flounder and Pout. Poole Harbour: With not much rain over the past few days the Flounder fishing has really picked up again in the harbour. 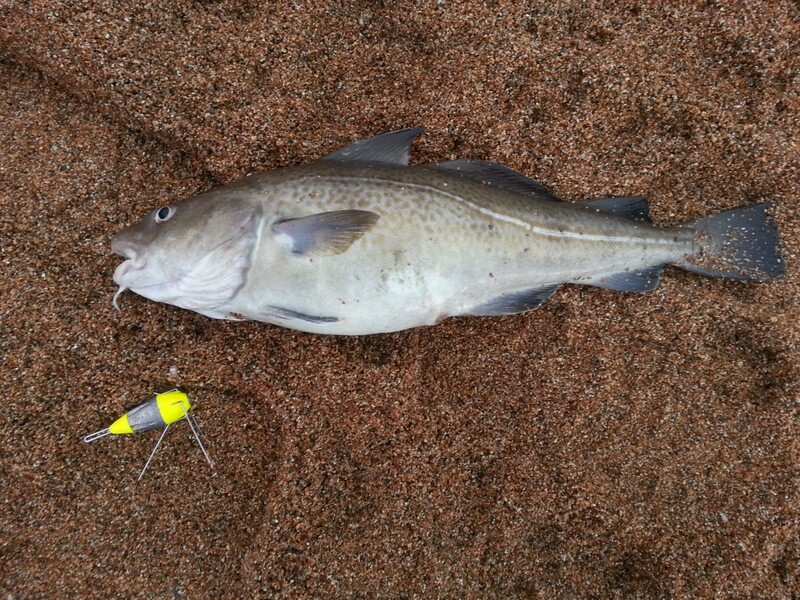 Several anglers have told me of catches well into double figures, with some School Bass amongst the Flounders. Ragworm and Peeler crab are the best baits. 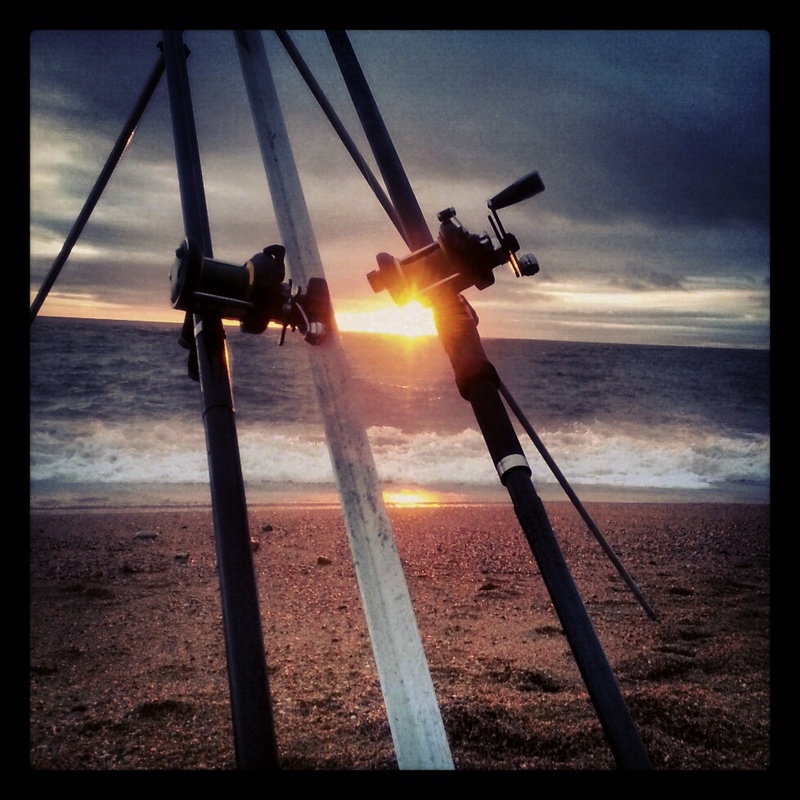 One Response to "Catch report & fishing forecast for Dorset including Chesil Beach, Portland & Weymouth. 4th January 2013"
On 3rd jan I Fished Abbotsbury a hour before, during and about 3 hours after the mornings high tide using rag, squid and mackerel as bait and caught nothing, two blokes either side of me had the same result, I left went down to ringstead for a couple of hours that same evening and caught a wrasse just over a pound and two pound bass both on rag as the tide was coming up about three hours before high tide.